This was the last game of the day, where you could see everyone including the table officials and referees had put in long hours, in fairness, but for this group it was a critically important game to show they were in the top handful of teams in the country. This time Star got off to a great start, and jumped immediately on Maree, and built a commanding lead in the first half. But again, and likely with fatigue setting in, some poor decision-making and specifically execution around the ring, and more woeful free-throw shooting, allowed their opponents back into the game (free-throw shooting has been the achilles heel for the team all season, despite a lot of coaching attention). But just when it was needed to give John Smye and Peter Henvey some much-needed support on the offensive end, back-to back ‘treys’ from John Moran provided Star with much-needed daylight in the clutch 4th quarter, and Star again held on to get a fantastic win, setting themselves up to take out the other Galway team Moycullen the following day for 5th place. Star now face old friends Queens in the final next Sunday at the Antrim Forum, before setting off for Dublin to represent Ulster in the All-Ireland ‘A’ Championships, which has been the main goal all year. It will take another focused performance as they seek to stay undefeated in what has been probably the most competitive age-bracket of all the Junior competitions this year. But there has been clear development throughout the squad as the year has progressed, and the first sign of a few players putting their hands up as leaders, so here is hoping one more clinical performance will bring the rewards the team have worked hard for and deserve. "20-point final quarter turnaround sees Star win big in Cork"
Star got the weekend off to a great start with a solid display against Queens, coming out on top 66-46 in a well-contested game against their good rivals. In a sense, Star’s last-second defeat at the hands of Templeogue summed up the side's All Ireland Premier League season – so close and yet so far. So often during this campaign, Star have had the opportunity of victory within their grasp and somehow contrived to let it slip away. Yesterday’s heartbreaking loss left the team’s play-off hopes dashed. For Conor Johnston, who produced his best performance in a Star shirt, it was particularly painful as he seemed to have thrown his team-mates an over-time lifeline. Trailing 65-62 with five seconds remaining, Johnston slammed home a big three – one of seven he hit in the match. But American Isaac Gordon nicked it for Templeogue on the buzzer. Star made their annual winter track over the snowy Glenshane Pass for their last away match of the season, and returned with a satisfactory win over a plucky Blaze team who characteristically gave nothing away easily. The returning Kamil Kolos also contributed handsomely, snaffling up rebounds and getting in on the scoring act with 5 points including an ‘and 1’ play. But more needs to be done in understanding positional awareness on both ends of the floor, as on several occasions Blaze were able to evade the frontcourt pressure and get all the way to the basket, which was cause for some concern. Nevertheless, with Michael McWilliams anchorin﻿g the defense and Eoin Nagle being his usual feisty self, Star ended the first quarter up 21-12. Belfast Star coach Danny Fulton praised his "magnificent seven-and-a-half" after they went down fighting in a heartbreaking last gasp 83-81 defeat to second placed Killester in the All Ireland Premier League. Fulton, taking the reins with head coach Neal McCotter away on business, had travelled to Dublin with a weakened team and it didn't get any better when at the end of the first quarter Keelan Cairns had to leave the match through injury. Then in the third quarter Conor Quinn hurt his ankle and had to take a break before returning for the majority of the fourth quarter of the match.Nevertheless, Star played with real desire and intensity which had the Dubliners on the back foot in the opening half and at the break the Belfast men only trailed 41-40. With top performances from young guns Liam Pettigrew and Matthew Jackson, Star gave themselves a real shot at an upset victory. Ricky Taylor had two free throws to give them a three-point lead with 38 seconds remaining but only hit one and with six seconds on the clock Killester tied the game up. Just when it seemed that overtime was inevitable, Michael Westbrookes drew a foul from American Taylor with a second remaining and he clinically slotted home the two free throws to seal victory. Coach Fulton said: "I couldn't have been more proud of my players. "It was a case of the magnificent seven-and-a-half when you consider that we lost Keelan at the end of the first quarter," he commented. "Keelan was always going to be a crucial player for us so it was a big blow when we lost him," he added. "But Liam Pettigrew and Matthew Jackson came of age at this level with two great performances. Everyone really raised their game and they didn't deserve to lose," he said. Star dug deep into their reserves to emerge with a huge victory on their annual visit to the cauldron of St Macartan’s college in Monaghan, coming away with an important ‘W’ on a score-line of 47-34. Minus 4 of the squad, including sharpshooter John Smye and Ethan Gibson who has really upped his game in recent weeks, the coaching staff didn’t hesitate to dip into the u-14 squad and drafted up 3 players to step into the challenge that is finding a way to win in Monaghan – and boy did they step up to the plate. Star started off quite hesitantly, though, and the first quarter developed into a bit of a slugfest. Steelers settled into their predictable physical, inside-dominated game, and actually surprised Star by playing man-to-man from the get-go. The tempo of the game didn’t suit Star, and this was reflected in the fact they missed 3-4 relatively easy ‘chippies’, passes became hesitant and at the short horn, Star deserved to be on the wrong side of a 10-6 score-line. However, things changed when the second quarter unit got themselves into the game from the start, anchored by two huge performances from John Moran & Niall McGinnity. ‘J’ Mo showed real character, and did exactly what the coaching staff asked of him for this particular assignment, attacking the basket at the right times, making the right passes when required, and along with McGinnity owning the paint defensively. CJ Fulton injected crucially important tempo into Star’s game, and all of a sudden it was business-as-usual on both ends, Star seizing the initiative behind tough, aggressive defence and excellent transition and half-court offence. Conor Cook and Conn Doherty played like they belonged at this level, forcing turnover ball on defence and being very active and involved offensively, and the u-14s contributed to half of the points scored in the quarter. Star went in at the break 7 points up, taking the 2nd quarter 16-5. The money quarter was a wrestling match, with momentum switching over and back multiple times. Sloppy passing by Star allowed Steelers to get back into the game, with M O’Brien and Andy O’Connor showing signs of life, and again Star relied heavily on Eoin Nagle to handle the pressure and keep the team composed. Niall McGinnity, Michael McWilliams and John Moran hung tough on the boards at this crucial juncture, and Steelers were only able to claw back one point in the quarter, setting up the 4th for the big showdown. Steelers upped the ante by showing full-court press, and initially this unsettled Star and forced a few turnovers. But they regained their composure during a time-out, and in fact fought fire-with-fire, counter-pressing Steelers. This was the game’s sucker-punch, and Star seized the momentum and never let go. CJ Fulton gave Eoin Nagle invaluable recovery time to dictate the pace, as did Conor Cooke for Michael McWilliams. Peter Henvey bounced back from a forgettable first half to put his stamp on the game, ‘J’ Mo played out a deserved MVP performance and Daniel Hackett followed up his best game of the season with another solid contribution. Throughout the history of Belfast Star a strong defence has usually been the cornerstone of their success and yesterday the current crop of All Ireland Premier League players brought that to the fore in an impressive victory over Dublin Inter at MCB. Star, who triumphed 89-77, shook off the disappointment of their defeat to Marian and gave themselves a ray of hope in their bid to make the end of season Top Four play-offs. Defeats suffered by Killester and Templeogue, who they face in the next fortnight has certainly bolstered that belief. While American Ricky Taylor stood out with his 29-point contribution, along with seven rebounds, others weighed in with significant points. Fergal Toner notched 11, Paddy McGaharan 10, Brian McCotter eight and Keelan Cairns four and all showed real steel in defence to snuff any chance of Inter turning the game their way. Cairns, who had seven rebounds, stood up well to the physicality of the Dubliners, while McGaharan, Liam Pettigrew and Iheuk Duru all had three crucial rebounds. Star's assistant coaches Danny Fulton and Javan Dupree had to step up to lead the team at short notice as head coach Neal McCotter was called away on business, having prepared the team all week. "Danny and JF did a great job, we had worked the guys very hard on Friday night and they did the business when it came to match time," said McCotter. "With Killester and in particular Templeogue losing their games at the weekend we have given ourselves a glimmer of a chance to make the play-offs. "We are away to Killester next week which is going to be a very tough game, but they are clearly beatable. After that we have Templeogue at home which, in football terms, will be seen as a six-pointer." Star brought their ‘A’ game for the return match of the back-to-back series with Phoenix when they welcomed them back to Fortress St. Malachy’s, winning in emphatic fashion 85-30. This was the first game where the team delivered on the potential they have shown in patches this season, responding to the coaching staff’s demand for a sustained performance from start to finish, and in fairness did they ever. Jumping on the visitors from the start, Star rattled in 10 straight in less than 2 minutes, forcing Phoenix to call time-out as their team were clearly rattled. Michael McWilliams was the main beneficiary of excellent pressure defense on the perimeter by Eoin Nagle, Ethan Gibson & John Smye, getting on the end of multiple turnovers and racking up a quick 10 points in the first quarter. Kamil Kolos demonstrated again what a problem he can pose for any team on the boards, and was one basket shy of his first double-double in the first quarter alone, scoring 8 points all off offensive boards, and gobbling up 10 rebounds in total. It finished 29-6 at the break, and it really was entertaining stuff throughout. The 2nd Quarter five picked up where the first five left off, with John Moran orchestrating on the point, and the combination of Peter Henvey & Niall McGinnity doing their thing in the paint. The offence ran very smoothly, with John Moran, Daniel Hackett & Niall McGinnity all demonstrating good decision-making and a nice touch from the outside, and Peter Henvey beasting Phoenix inside, and even when McGinnity had to take a chill pill for a minor technicality, Przemak Kwiecien stepped in and kept things ticking over with his usual selfless team play. Score was 43-13 at the short horn. Phoenix didn’t lie down though, and despite being short their best player from the first game, kept slugging it out, P Corr & M Dmitrov connecting on a few treys to keep things interesting. But even with making wholesale 5 on/ 5off changes, Star kept their foot on the pedal, and it was great – and important – to see the players the whole way across the team posting great individual performances, and a few like Kamil Kolos and Daniel Hackett playing their best game of the season. Phoenix just couldn’t do much with the juggernaut coming at them, and Star closed the 4th Quarter off 23-4, making the final scoreline 85-30, a great performance. The team responded to the challenge the coaching staff put to them at training following the previous two wishy-washy performances, and hopefully they can build on this as they head off for back-to-back away fixtures in Monaghan and Donegal. For the first time the team showed that they can play without relying heavily on the scoring of John Smye, as he was intentionally spared in this game to keep him fresh for the upcoming all-Ireland school game this week. The scoring load was evenly distributed across the team, with 6 other players chipping in between 8 & 18 points, Michael McWilliams top-scoring with the 18. But when this Star team play like this, it will be difficult for any team in the league to live with them, and with Eoin Nagle, Ethan Gibson & John Moran driving things in the back-court, Star’s 3 ‘bigs’ McWilliams, McGinnity & Kolos dominating the paint, and Le John and Kawhi Henvey playing at their customary high level, the team is in good shape to develop as planned. UCD Marian established an early lead in this All Ireland Premier League contest and maintained it throughout the four quarters. It was the inside play of Preston Ross and Neil Baynes that did the most damage with the pair combining for 41 points. For Star, the fine shooting of Ricky Taylor kept the side in the contest but a run on their hosts never looked likely. 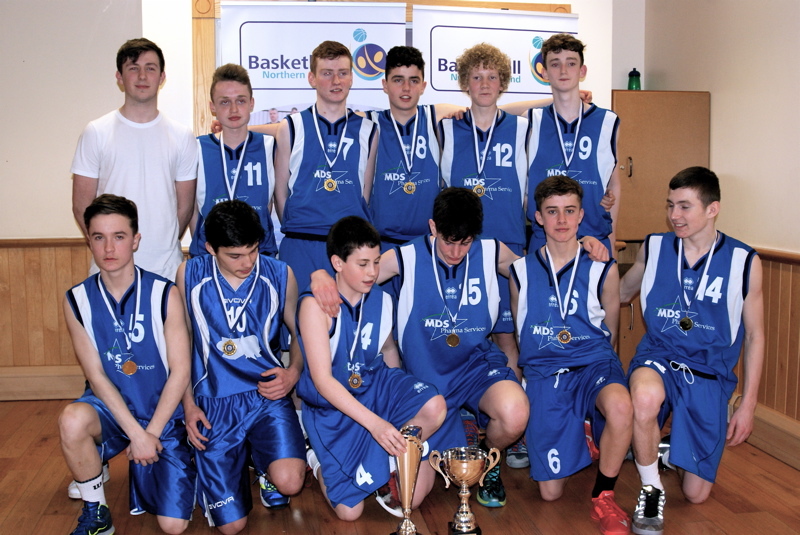 Star's U16 squad got off to an eagerly anticipated start at the weekend against Queen's B.C. Since Rip n' Run camp in the summer the boys have been preparing for their season ahead, keen to get of to a good start.